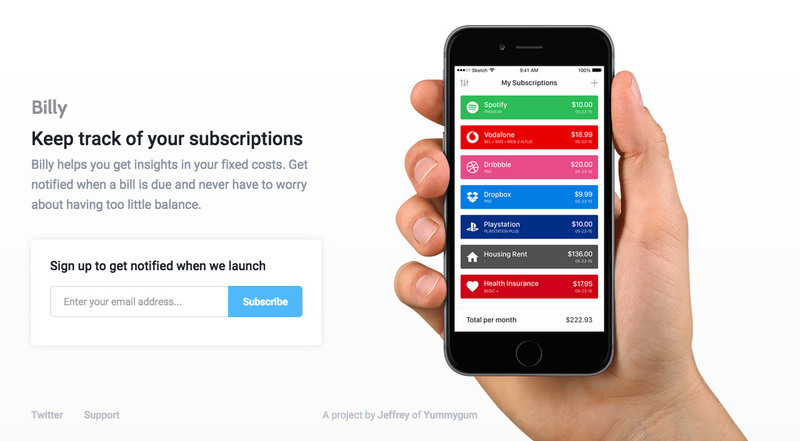 Launching soon page for upcoming “subscription tracking” iPhone app titled ‘Billy’. The screenshot preview is clear and I quite like how the mobile adaption loses the hand. Coming soon page for a new iOS app I'm working on called Billy. Billy is your personal assistant that helps you to easily keep track of your subscriptions. Get notifications when a bill is due and get insights in your fixed costs. Aimed to make the website as clean as possible to maximize the focus on the actual product.